Making your bonsai tree look full can be difficult sometimes when it seems like you do not have enough foliage to work with. Below are two tips that may help you next time you’re looking to push back growth toward the trunk. 1. Wire a branch or trunk with the appropriate size wire. Bend or curl the branches back towards the trunk and use the outside foliage as inner branches. By doing this, you can create some unique movement in the trunk of your tree while pushing back foliage closer into the trunk giving you some extra branches. 2. Wire the secondary branches. By wiring the secondary branches once you’ve brought in the trunk or thicker branch, you can adjust and place the secondary in the space to fill in the gaps. 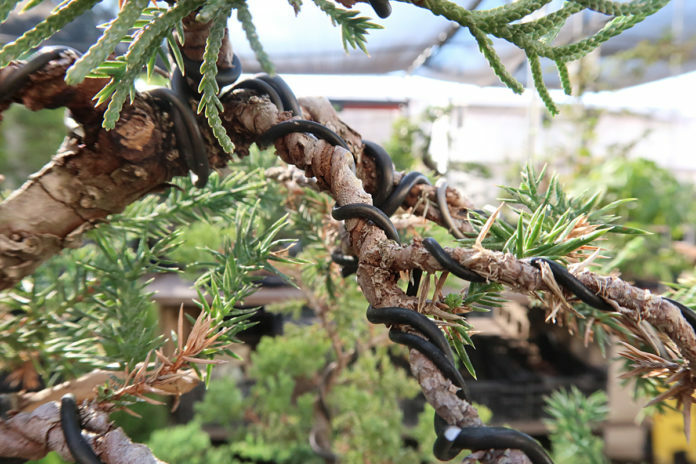 You can do this with as many branches as you need to fill in space on your bonsai tree. Next articleIkebana: Simple Guidelines for Creating your Own Arrangement.